Rolled Hem Hemming Foot for Industrial Sewing Machine 4.8mm 3/16 INDUSTRIAL ..
Zipper Zip Foot, Hinged Narrow works for most models Industrial Sewing Machine Part No.. 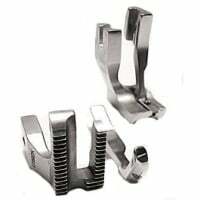 Rolled Hem Hemming Foot for Industrial Sewing Machine 1.6mm 1/16 Original Quality..
1/2 Walking Foot Single Piping Foot Set S30/S31 The foot is designed for inserting 1/2 ..
1/4 Inch Piping Foot Set for Industrial Walking Foot Sewing Machine 1 set of 1/4 inch piping..
1/4 Walking Foot Single Piping Foot Set S30/S31 The foot is designed for inserting 1/4 ..
1/4Single Piping Foot The foot is designed for inserting wide piping cord down the le..
1/8 Single Piping Foot The foot is designed for inserting wide piping cord down t..
1/8 Walking Foot Single Piping Foot Set S30/S31 The foot is designed for inserting 1/8 ..
2.4 mm 3/32 Rolled Hem Hemming Foot for Industrial Sewing Machine Universal industrial sewing mac..
240130 Outside left cut zip foot walking foot sewing machine Industrial sewing machine walking fo.. 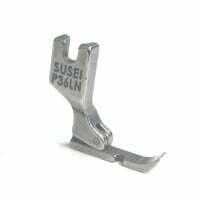 Rolled Hem Hemming Foot for Industrial Sewing Machine 3.2mm 1/8, Original&n..
3/16 Top stitch right guide feet S 583 Spring Edge Guide Top-Stitch Foot Set This is A B..
3/8 Walking Foot Single Piping Foot Set S30/S31 The foot is designed for inserting 3/8&..
5/16 Walking Foot Single Piping Foot Set S30/S31 The foot is designed for inserting 5/1.. Walking Foot Needle Feed ZIP FOOT 240130 OUTSIDE ZIP FOOT TOE ON LEFT SIDE. 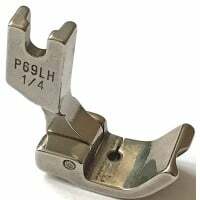 These feet will fit t..
Invisible Zip Foot with Guide for Industrial Sewing Machine The Invisible Hinged Zip Foot with Gu..
Industrial Sewing Machine Hinged Zip Foot RightSide. The needle on the right side Brand.. 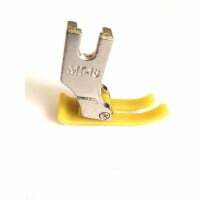 OUTER ZIPPER FOOT FOR WALKING FOOT SEWING MACHINE- U 192 The outside foot has a single toe whic.. 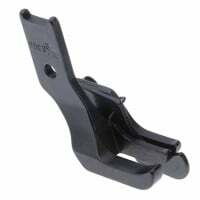 OUTER ZIPPER FOOT FOR WALKING FOOT SEWING MACHINE U 192R The outside foot has a single toe which .. 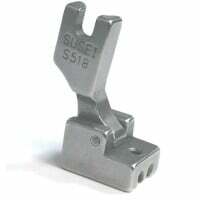 Right Cut Narrow Zip Foot for Industrial Sewing Machine Industrial Sewing Machine Zip..
Teflon Foot Heavy duty for Industrial Sewing Machine works on most Industrial Sewing ..
1/4 (6.4mm)Walking Foot Single Piping Foot Set S30/S31 The foot is designed for inserting 1/4..
5/32.3.9mm Walking Foot Single Piping Foot Set S30/S31 The foot is designed for inserti..